December is a busy month for most with things like holiday shopping, family get-togethers, and Christmas parties to occupy our time. It’s a time for peak cozy and that should totally be reflected in our outfits, if you ask me. Here’s a couple outfit ideas for the most common holiday season activities. If you’re out at your favorite stores and, hopefully cobblestone, shopping streets under all the tree lights with a cup of hot chocolate, you’ll want a look that’s both comfy and elegant. I like a slouchy cream sweater to keep cozy paired with black skinny jeans and a pair of suede, knee high boots. As for bags, the Longchamp Le Pliage is perfect for a shopping day because it’s big but lightweight. Go for a more rustic, functional look when you’re at the farm picking out your Christmas tree. 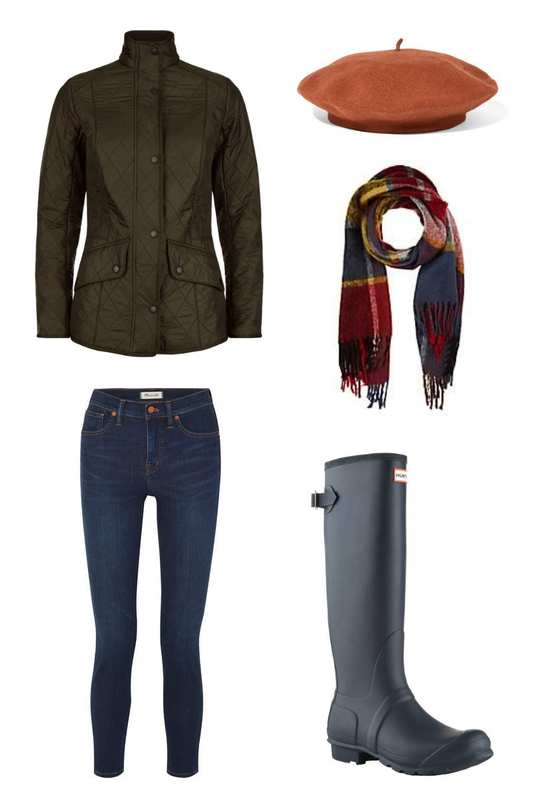 A quilted jacket will keep you warm and rubber wellies will protect your feet from the inevitable mud. Pair those two items with skinny jeans that are easy to tuck in, then accessorize with a festive scarf and coordinating beret for that picture perfect look. I love a chic, neutral look for holiday parties. You can totally be festive without having to resort to sequins and sparkle. I love the idea of a ribbed sweater dress paired with textured suede ankle boots. To add a little seasonal vibe, try a burgundy velvet bag and add some sparkle with gold celestial earrings. Finally, the look isn’t complete without the perfect red lip. When you’re in the kitchen baking gingerbread men and watching your favorite holiday movies in the background, you definitely want something warm and cozy and comfy for home. I love a white Patagonia pullover with warm leggings, holiday themed socks, and a cute apron, of course, to protect your clothes. Finally, when the big day arrives, we’re all spending the morning in our cutest pajamas hopefully drinking something warm around the tree before going out for the day. For this, try a pair of the softest gray pajama pants with the perfect white tee, and a cuddly cardigan layered over it all. To keep yourself at peak cozy, add slippers for your feet and a pom-pom beanie for your head.